"I Make £500 a week laying horses because I don’t." "I Lay horses at £100 a time, because I don't"
Would you like the answers to these questions and so many more like them? Why do some favourites romp home while others don't even place? Why do some races produce a higher percentage of losing favourites than others? Why do some favourites perform badly at certain courses? Like me you are probably sick and tired of reading sales adverts for...hyped-up overpriced systems promising to make you life changing sums of money within weeks. These adverts are aimed at inexperienced punters and are full of ridiculous clichés and empty promises they cannot possibly deliver. They sound great in principle but rarely fill your bank account. In the real world things just aren’t like that. Come on lets be realistic how many of you guys actually believe that you can go from a full time job to professional la yer in just a few weeks using the latest miracle system that only takes 10 minutes a day to implement. These people are total rip-off artists trying to pull the wool over your eyes. Furthermore who can honestly say that that they could afford to lay horses at £100 a time very few I would imagine. To be honest most punters are their own worst enemies and generally they will bet on any old race, which is definitely the quickest way to the poor house. There is just far too much racing around at present; at least 80% of it should be completely ignored as a betting medium. Being selective and learning to specialize is essential if you want to succeed and profit long-term from racing. When we do spot a false favourite we want lay them at the shortest price possible. One of the biggest mistakes inexperienced punters make when reading form is they take everything at face value. You really need to know how to quickly identify what's important in deciding whether or not a horse will lose. This requires reading between the lines a little , which is a skill, but like any other it can be taught. Racing is not unlike any other sport in the sense that there are fundamental rules but it can change over time. For example new training methods can be introduced, course drainage and characteristics can change; even the time of year will have a bearing on results. Trainers rarely maintain consistent form for an entire season. In other words something that worked well a few years ago may not work with any consistency now, due to external factors not accounted for in there original conception. Any good system should be updated periodically when new external factors are discovered, which could ultimately affect future performance and profitability. And share with you all the powerful information that I've learnt the hard way through trial and error over the years. Everything that now enables me to make a realistic daily profits from racing. Don’t waste another moment of your precious time, or money on any of those other overpriced useless systems, or tipping services that just lose money. Believe me I've already been there and back twice over, got the t-shirt. All this research and much more has gone into creating my system false favourites, which will show you exactly how to make consistent profits laying horses over; Jumps on the Flat and the All Weather, furthermore you will get all the updates and new developments to my system as they happen totally free for life. Learn How To Become A Profitable Punter Right NOW! 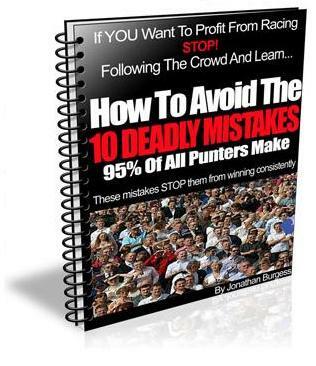 Get a FREE copy of..."HOW TO AVOID THE 10 DEADLY MISTAKES 95% OF ALL PUNTERS MAKE " (Worth £29.99) This 33 page ebook reveals the *Closely Guarded Betting Secrets* Pro Gamblers use every day to eliminate careless mistakes and cash in on the right betting opportunaties. Just fill in your details below and download it within the next few minutes. AND thats not all, YOU will also get access to "The same secrets PRO LAYERS keep closely guarded "
Just quality FREE information about making regular profits from betting on horses. FULLY UPADTED for 2009-2010 The manual now includes clear instructions on - how to navigate, find and assess all the racing elements of the new Racing-Post.com website. I have created a very comprenhesive guide to help everyone get the best use out of the site. REVEALED: The fundamental differences between each type of race in both flat and National hunt racing. Knowing the differences between handicaps, maidens, novices, sellers and claimers are vital. All races are not the same. Years of statistics prove that certain types of races have proven to be the most profitable for laying the favourites in. I will teach you which to bet and which to avoid. EXPLAINED:Why laying horse on the flat isn’t the same as laying over jumps or on the A.W. You need to apply a slightly different set of rules to have equal success at all three. False Favourites clearly shows you what to look for and highlights the pitfalls to avoid. REVEALED: The factors that make certain favourites less likely to win their races. Everything is clearly explained, showing you exactly what to look for. I have even including a full proof guide of “How to interoperate all the vital form information", complete with screen shots so even a total beginner can follow. EXPOSED:Why most horses are favourite simply based upon their most recent form. Bookies know that most punters are unable to put previous form in to context with a horse’s current race. Subsequently they don’t look any further than a horse’s last time out finishing position; a deadly mistake we can profit from. I will teach you how to tell the difference between the odds on favourite that will romp home and the one that has no chance; leaving YOU With a very low risk lay bet. Britain's racecourse are the most varied of any racing nation in the world. Favourites often lose because they weren't able to handle the track. With False Favourites you get not one but two complete UK racecourse guides with all the essential characteristics and vital statistics for each course clearly explained. With a quick glance at these guides you will instantly be able to identify races and tracks where the favourites win well below 30% of the time. EXPOSED: Why other lay systems fail to make a profit all year round. Racing isn't like any other sport and there so many factors that need to be considered, especially the time if year, after all we are dealing with animals not machines. Opportunities and conditions change and we need to adapt with those changes to remain in profit consistently. There are certain months in each race code that you need to be aware of, as they can be more profitable for laying favourites than others. Real examples of races I actually layed the favourites including screen shots with complete analysis, and explanations behind my reasons for doing so. EXPOSED: The myth of when to place your lay bets to secure the lowest odds and minimize any potential loses. This is in total contradiction to what everyone else is telling YOU. Don't follow the herd everyone knows the sheep get fleeced. DISCOVER:How to avoid the costly mistakes most punters make by overplaying the market. This is why most other systems produce up and down results. REVEALED: The 10 golden rules successful punters follow religiously. 95% of the punting masses continually make the same stupid mistakes time and time again. 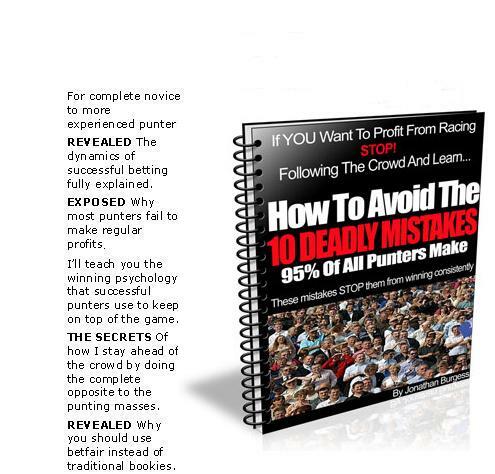 I will teach you how to avoid these mistakes, and show the 10 essential rules you must follow Dailey to internalize the winning psychology used by successful punters. YOU definitely will be able too, once YOU own this system...The proven methods I describe will make it clear that you have a powerful resource at your disposal, giving you a very valuable edge over 95% of all punters. The statistics are firmly on your side. When I first saw your add I was a bit sceptical about buying the system. I’ve tried other more expensive lay methods before without much success. They say you have to try a few before you find one that works, your system definitely does. Now I know why I wasn’t making any money before. I was using the wrong systems. 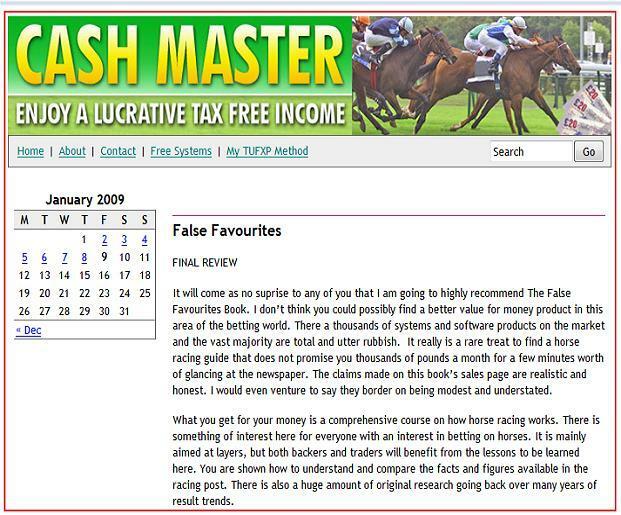 I’d like to thank you for providing me with a way to make a nice second income, false favourites is an absolutely brilliant method for selecting horses that have little chance of winning. False Favourites is a excellent system that actually works surprisingly. Jon doesn’t advise you to lay loads of horses a day like others do. Not only that he gives full explanations on why certain favourites are likely to lose their races in an easy to understand way. Since buying the book my knowledge of racing has increased immensely. It explains a lot more about racing than just laying horses. Being able to see the bigger picture has stopped me from repeating many of my past mistakes. In my opinion its wrong tell you to do something without explaining why, which is exactly what others systems do, thankfully not this one. I would like to teach YOU how to make realistic daily profits from laying horses with my easy to use system. When I first starting betting on horses I used tipsters for my selections thinking that I was getting the best advice. Over the years I’ve tried many services and to be honest most of them fell into the category of what I would call the con zone.. They quoted unbelievable results in a glossy brochure and the minute I joined hit losing run after losing run, or gave me obvious short priced selections that I could have obtained for free in most daily newspapers. Most of us have been there at some stage in our betting, if you haven’t... be wary it can prove costly. Racing is an inexact science and can be pretty unpredictable at times. Having said that there are predictable elements we can identify in order to determine that a horse won’t perform to its optimum ability. For example – It started to become apparent that laying horses on the flat wasn’t the same as laying horses over jumps and a slightly different set of rules was needed to have equal success at both. Other obvious flaws included, advising punters to lay far too many selections per day;laying horses at larger odds, definitely risky as you all know the odd 14/1 shot will win on occasions and could potentially wipe out your bank in an instance. Especially when linked to specific types of races. If we Avoid races where the favourites have high winning strike rates, and concentrate on the remainder that don’t a big advantage over the crowd can be obtained. After all Britain’s racecourses are the most varied in the world. The 30% winning average for favourites which is so often publicised is just that; an average and is by know means the whole picture. I have spent many months analysing the most recent 10-year statistics for both flat and national hunt codes. The results are so conclusive that they cannot be ignored. It is no coincidence that the bookies like to sponsor certain races more than others; luring the undisciplined punting masses into their honey trap with over generous odds. Would you like to know which race types and which courses produce the most losing favourites? Once you own this system you will. Information such as this will tell you almost instantly, which favourites have the odds totally staked against them before they even race. All this research and much more has gone into creating my system false favourites, which will show you exactly how to make consistent profits laying horses over Jumps on the Flat-turf and the All Weather. Furthermore you will get all the updates and new developments to my system as they happen totally free for life. 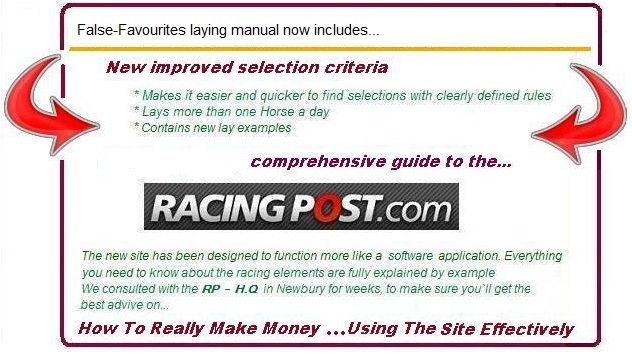 What a first rate laying manual and excellent racing resource false favourites is. This is a great value for money package , with superb laying information. Thanks for all your help Jon, you are a genuine guy who gives excellent customer service. 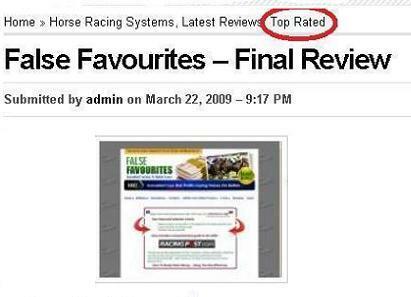 False Favourites was written by Jonathan Burgess who appears in the Betfair academy as an accredited trainer. I requested a copy of False Favourites to review and Jonathan duly obliged in a timely and friendly manner which is always a positive for me. After all, if you’re confident in your product then why wouldn’t you want it reviewed? The market is swamped with laying systems at present and in general most are not worth the paper they are written on. Due to this fact I wasn’t expecting False Favourites to be any different if I am totally honest. I came across false favourites lay betting by Jonathan Burgess in my mailbox on Friday and was immediately struck by the enormity of it. It's an e-book consisting of well over 200 pages! Surprisingly, hardly any of the content was the usual Betfair rubbish. It was full of sound advice on finding favourites that are likely to lose and an almost psychological approach to laying horses. The book is split into three parts; National Hunt, Flat and the all weather. A slightly different approach is required for each code. Three years trading on betfair has taught me an awful lot about how to profit from racing. 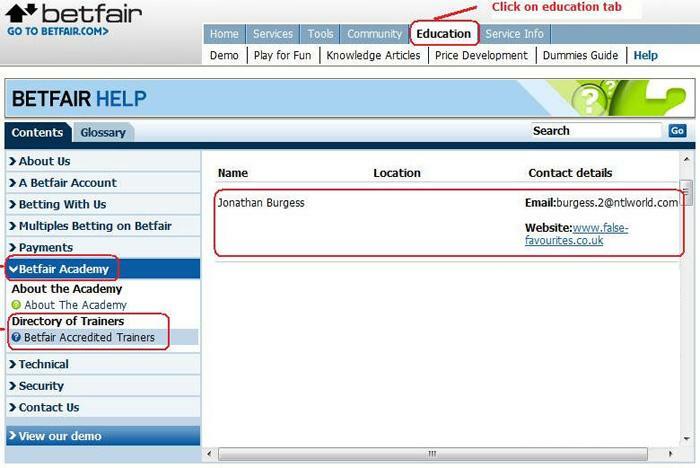 So much so that I decided I would also like to help others benefit from my experience and eventually became an official Betfair accredited trainer. Not only has False-Favourites proven to be consistently profitable but, also highley recommended by customers all over the world. 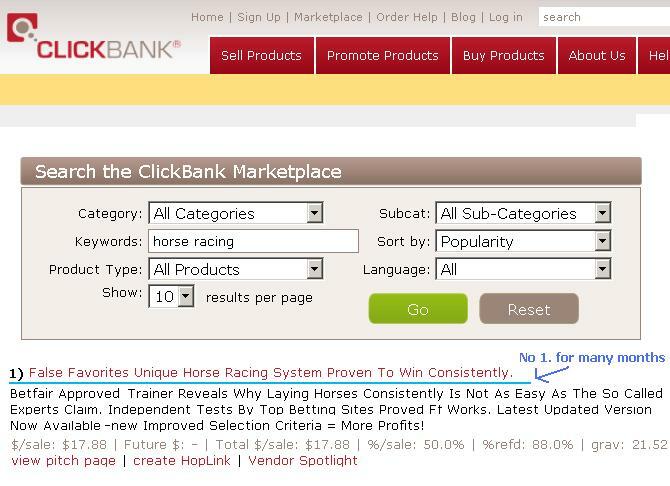 The system consistently ranks in the top 10 on click bank and was the number one horse racing product for many months. lets not forget only 1 in 3 actually does. These punters believe the media hype; 95% are backing the favourites to win because they are lazy and have no method or system to their betting, they simply can’t be bothered to spend a little more time and effort delving deeper into the racing pages. To Succeed, YOU need to do the opposite of what the crowd is doing. These factors will ultimately determine whether the horse actually goes on to win or lose. After all how can you tell the difference between the odds on favourite that doesn’t even place and the odds on favourite that romps home by 10 lengths? Well unfortunately YOU wont, unless YOU have access to the right information. Originally I developed this system for my own personal use but when I realized its potential I decided that I would like to give other punters this very powerful method of making money-laying horses. 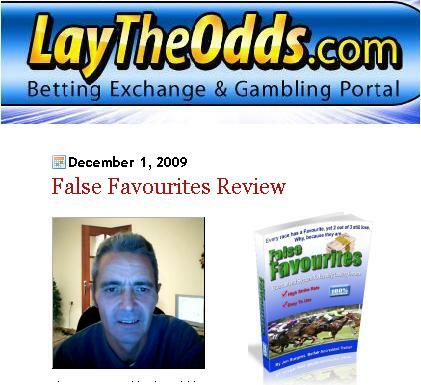 False Favourites is a system that has taken two years to put together and has constantly been reviewed, changed and updated. What YOU will be getting is the full, finished, tested version at your disposal every day, which will cherry pick all those false favourites with some accuracy and give you a massive advantage over the crowd definitely a wise investment £££ wouldn’t you agree! I've spent literally years betting and testing systems and in the process made virtually every mistake in the book. It really has been a very large learning curve, which in the end has resulted in me being able to create a very profitable system. Now I can pass on all this powerful information to YOU. All you have to do is follow the easy-to-use methods clearly laid out in the e-book. I want you to be completely satisfied so I’m going to make this investment opportunity completely risk free by offering you a 100% money-back guarantee to give you total peace of mind. I will refund your money if you fail to make a profit using this system. How much should I sell my very profitable system for? Everyone has a different opinions about what information is worth. One thing I can say though is there seems to be a lot of very over priced racing systems on the internet at present. Buying a product on the internet is similar to buying a product from the high street, the main difference being the internet seller generally has a lot less over heads, so in theory there should be major savings to be had. Unfortunately this isn’t the case. What we should all be looking for is value for money and paying anything upwards of £50 to £300 for a racing system that isn’t worth a fraction of that amount offers absolutely no value at all in my opinion. Why pay double what a system is actually worth? I could easily join the rest and sell False Favourites for £50 to £100 and it would still represent brilliant value for money, but I’m not going to and I’ve decided to set the price at a very affordable £27.99 . If you have ever subscribed to a tipping service you know it will cost you at least double that for just one month and that is not even taking in to consideration how much you could potentially lose through bad advice. False Favourites will provide YOU with a lifetime of profits for a single one off payment of just £26.99, which you will definitely recoup after your first few bets. A pretty minimal amount to invest in YOUR future, wouldn’t you agree? You would spend more taking the kids out for a burger. We will be selling these bonuses separately very soon and they are available FREE for a limited time ONLY with this package. Don't miss your chance chance to GET THEM TODAY! Please note CLICKBANK may add V.A.T to certain buyers in the E.U. YOU can Subscribe to this right NOW! And so much more FREE information to help you to be successful. One months FREE subscription to the "BETTING SCHOOL INSIDERS REPORT"
New profitable systems reviewed and tested every month. Download free automated betting tools to make money while you're out! Video presentations that show you exactly how to use the software products that we test and how to perform specific betting strategies. Read the secrets to betting success from our resident pro gambling writers. Our monthly system would cost you up to £99 from other websites. As an e-book owner you will get the latest updates to my book totally FREE!. I am always testing systems and adding the best quality information. It has taken me years and cost tons of money to learn how to get it right consistently. For one low price, you'll get to benefit from ALL my experience. Just think about it this way. 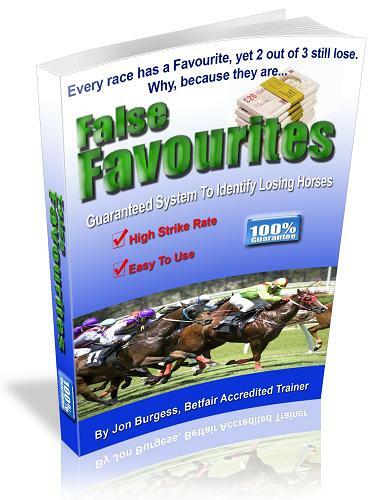 For just - £27.99, you can finally start to make real money from laying horsesDownload False-Favourites now and let me share with you the most profitable secrets that pro layers use everyday, none of this get rich BS hype that everyone else is selling. PS. If you've tried to make money before laying horses and failed. If I'm honest it probably isn't your fault, more than likely you have been using one of the over hyped non performing laying systems. False-Favourites isn't the same as all the other junk out there. This is a very comprehensive laying course that will teach what you really need to know in order to make consistent cash! Let me give you my tried and tested methods for making money from losing horses so that you can start making money finally!